We have your small intimate weddings at an affordable price. We have partnered with many different venues that have accommodations for small weddings that will work with The Little Wedding House making your dream come true. 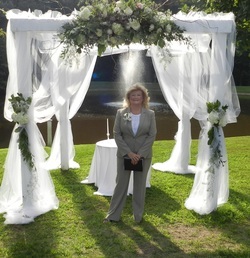 We perform weddings throughout the Fredericksburg area. Some of the options are parks, Carriage Rides, and at historical sites to mention a few. Numerous indoor locations are also available. Now offering our own venue in Bowling Green, VA - Magnolia Morning. The Little Wedding House can provide the officiate (marriage commissioner), music, decorations, catering, cake, photography, flowers, and local hotel accommodations at a discounted rate or any other service you may need for your special day. Our vendors have special prices for the smaller weddings when you book with Little Wedding House. We work with weddings for 40 or less but will be glad to assist you if you’re planning for a larger wedding.